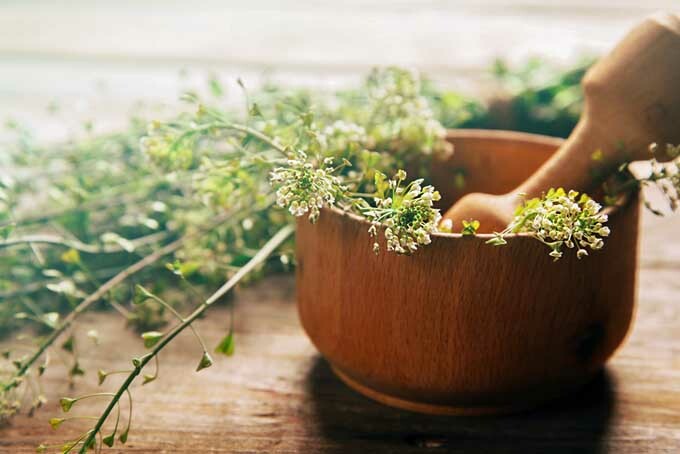 The mortar and pestle is an ancient tool that’s been around for millennia, with the earliest ones found dating to 35,000 BC. 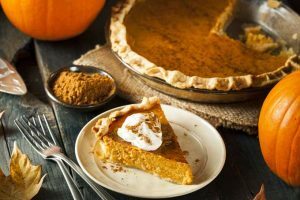 It’s been used for a myriad of purposes from alchemy and cooking to pharmacology and masonry, and is a utensil that no modern kitchen should be without. Handy and convenient to use, they also add a touch of dramatic flair to any kitchen décor. They’re great for cracking spices and peppercorns, grinding aromatic roots, crushing tender herbs for pesto and pastes and even for crushing medications for pets and humans alike. 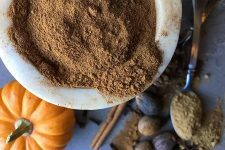 If you’re using an electric spice grinder or food processor, you may be missing out on the finer and more subtle flavors that emerge in the hand-grinding process. 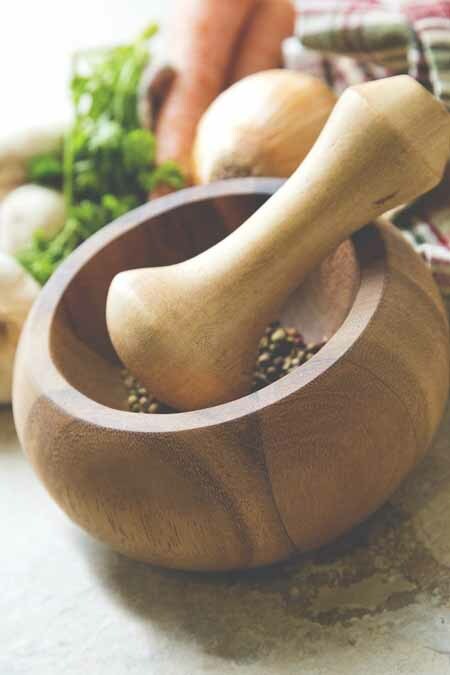 And often, a well-constructed mortar and pestle will outperform its electric counterparts in terms of ease of use, clean up and convenience as well. Let’s have a look at our number one recommended product. Then we’ll transition into to how to effectively use a mortar and pestle, after which we’ll cover some points to consider when buying. Then we’ll review some of the top rated models to help you to refine your search. Designed by well-known English kitchenware specialists Cole and Mason, this handsomely polished 7-inch granite model will take care of all your grinding and crushing needs. Another clever design feature is the manner in which its heavy weight is distributed in three sections, holding the weight of the bowl low in the mid-section for outstanding balance – it holds steady and stable even under the heaviest pounding. The interior profile of the mortar has a slightly rough texture, which is suitable for both wet and dry mixes. And the long, comfortable pestle makes full contact with all ingredients, keeping them in place during processing. The mortar weighs in at 13.5 pounds and the pestle is 1 3/4 pounds. The generous and deep bowl stands 7.5” high and measures 7.5” across, with an inside diameter of 5” and a depth of 3.5”. 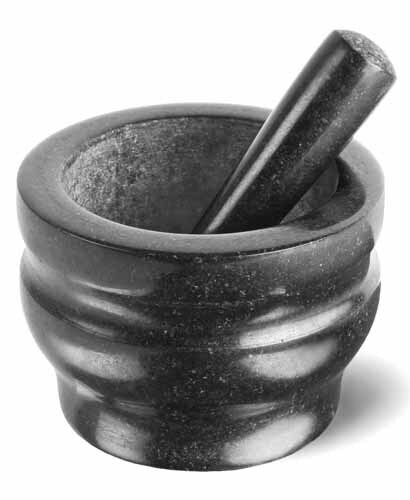 The pestle is 8” in length with a broad and narrow end, both of which can be used depending on the purpose. Created out of superior quality black granite, it has a sleek, polished finish that serves both style and functionality. Positive comments abound from the reviewers on Amazon with the most prominent being about the excellent performance. Happy customers report that the interior of the bowl has just the right amount of texture to grip ingredients for easy and efficient grinding. Another noted feature is the stability of the mortar. The distribution of its weight provides outstanding balance so it stays steady on the counter without any shifting or sliding, regardless of the motion used. Shoppers also report that it’s easy to clean, and the high quality of the professionally polished granite makes it a beautiful accessory to any kitchen. Check it out on Amazon today! 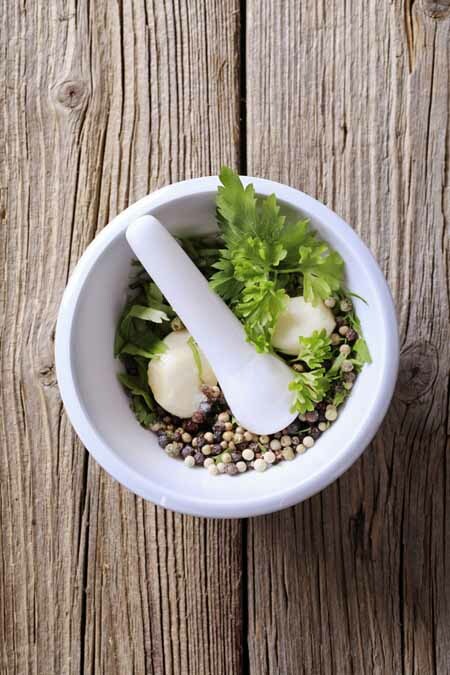 Why a Mortar and Pestle? Crushing the fibers of herbs, as opposed to chopping through them, releases the full range of essential oils, flavors and aromatics they contain – it’s what gives chili and curry pastes that distinctive breadth and depth of flavor that you won’t find if you’re prepping ingredients with a food processor. This is particularly noticeable when working with highly fibrous spices, aromatics and roots – such as lemon grass, galangal, garlic, ginger and kaffir lime peel. 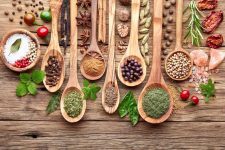 And when different herbs are ground together this way, their flavors join and meld into one, bringing forth a delicious paste that is greater than the sum of its parts. Although dry in appearance, they’re loaded with fluids and will reduce to a moist paste when pounded. 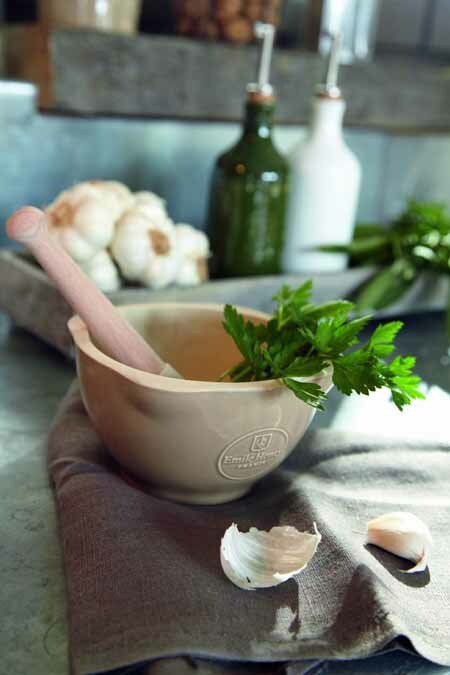 To get the full flavors and fragrances of crushed herbs and spices, a mortar and pestle set is essential. What to do if you grind too much to use in a single recipe? 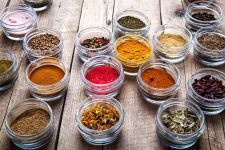 Though they should be used quickly for the most flavor impact, home-ground spices can be stored in jars with the rest of your herb and seasoning collection. To get your spices organized, check out Foodal’s review of the best spice racks. 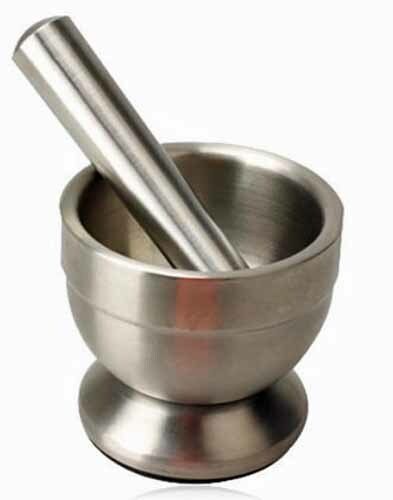 Ideally, you want a mortar and pestle made out of a material with a substantial heft to it, and a hard surface. Overly rough or porous surfaces should be avoided as they’re difficult to clean, while ones that are too smooth will be slippery, causing ingredients to squirt out. Before buying, know what you want to get out of your set. If you plan to create pastes and tapenades for a dinner party of eight, look for a set that has a larger capacity and deeper well to adequately hold the ingredients, with room to mix them together. However, if you plan on using it for the sole purpose of crushing up meds once a day, a smaller model may suffice. Choose a set based on your kitchen needs and personal preferences. You want a bowl that has enough weight to remain relatively stationary, and that has a slight pebble or matte finish to create enough friction to grip ingredients. A deeply rounded well will keep the ingredients from squirting and jumping out, while shallow ones won’t contain them as well. You also want a bowl that has enough strength and bottom weight to remain relatively stationary when applying pressure, and that has the capacity for your intended use. Look for a set that has a slight pebble or matte finish to create enough friction to grip your materials when crushing, but that is still easy to clean – often this slightly rougher finish will be in the well of the mortar and the bottom half or so of the pestle. 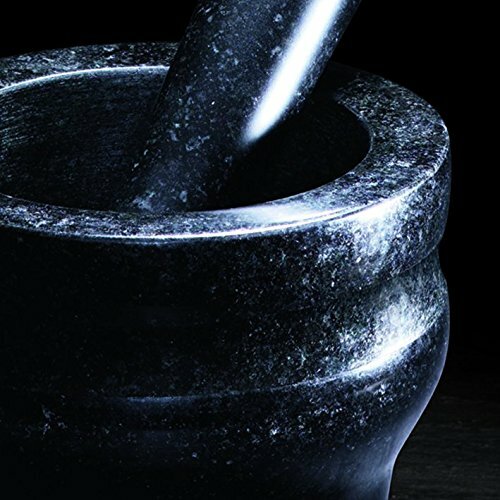 When searching for a pestle, look for a wide, gently curved base broader than the tip, and one that’s wide enough in girth for comfortable handling. 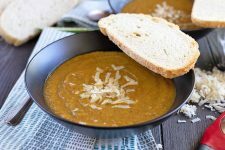 The broader base is necessary to keep the ingredients in the bowl. Give the set’s weight some consideration. A large granite set can easily push 20 pounds, which can be difficult to handle for some. Overall measurements are important too. Try to find a similarly sized item to place on your countertop before you buy to get a better feel for the dimensions. Try to find a mortar with a felt pad on the bottom, or be prepared to glue one on yourself. It makes for easier sliding on the countertop without scratching the surface. Most stone models are very effective, particularly those made of granite or marble. They’re heavy and can be finished to a matte pebble surface, and they can withstand heavier pounding. If you find chalk in the bowl from the machining process, season with white rice before using. Simply pour in some dry white rice, and grind until powdery. Discard the rice and repeat until chalk free, then rinse with warm water and dry. This is also an effective way to remove any stains or strong odors from a stone bowl. Avoid using soap if you can, as the semi-porous stone can take on a soapy flavor. Rinse well with warm water and dry. And if you’re concerned about bacteria, bring out the lemons. When you’re finished rinsing, season in the juice of half a lemon, rubbing generously all over with the lemon itself. Let it sit for a couple minutes, give it another light rinse, then dry. Wood is a very handsome material for this type of utensil, however, it’s often too light to be effective for any heavy-duty tasks awaiting it in the kitchen. Clean using the same method as you would for stone sets. Other common materials have their shortcomings as well. Clay is fairly porous and somewhat fragile for pounding. It should be washed using the same method as for a stone set. Light weight and the potential for breakage are concerns with porcelain, but it can be washed in the dishwasher. And stainless steel has a slick and slippery surface, making the ingredients jump. Stainless can also be cleaned in a dishwasher. 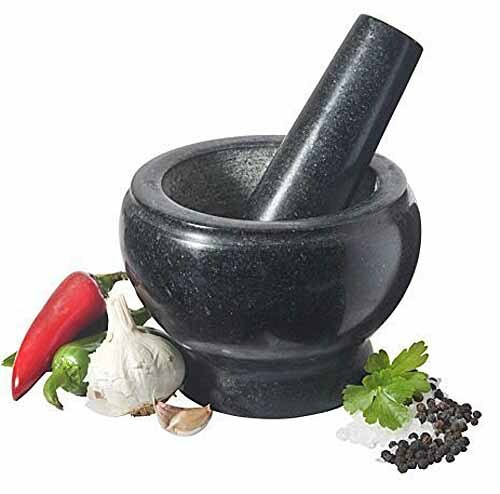 The mortar and pestle is the ideal tool if you want something ground into a paste or powder. 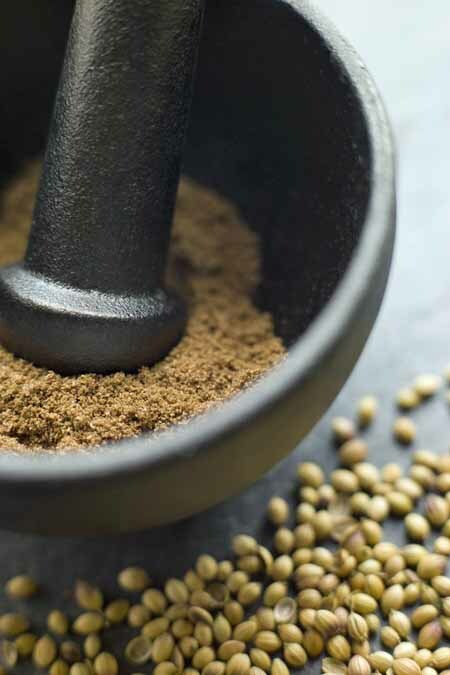 Common ingredients for grinding, crushing, pounding or bashing include: peppercorns, seeds, whole spices, aromatic roots, the seeds of herbs, fresh herbs, leaves, rice, legumes, nuts, sea salt, and non-culinary items as well, such as medications. Basically, anything that requires crushing or grinding for baking or any kitchen recipe is likely to work very well in the mortar and pestle. Ingredients requiring chopping, pureeing or blending may be better suited for the food processor or blender. 1. Read the entire recipe for instructions. Many recipes will call for a paste or powder, and the best time to prepare them is before they’re needed. Pre-mix as per recipe instructions. 2. Gather your ingredients. Measure and add to the mortar all the ingredients called for. Don’t fill the mortar more than approximately ⅓ full with raw ingredients. 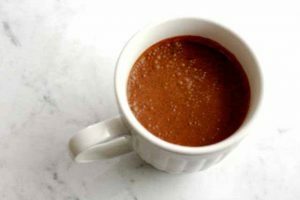 Otherwise, it will be difficult to process with an even grind – you can always add more ingredients as they break down, or work in batches. 3. Use the pestle to reach your desired consistency. Hold the mortar steady around the base with one hand, and with the pestle in the other fist, twist the ingredients against and around the bottom and sides of the mortar. Grind evenly, crushing all ingredients and using the pestle to mix and mash until all have been reduced to the same consistency. 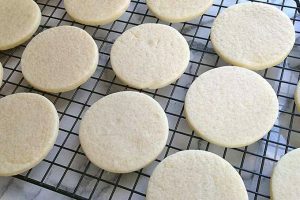 Continue until the ingredients have reached their desired texture: fine, medium or coarse. 4. Measure and store. 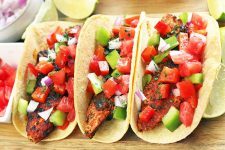 Measure out what you need for the recipe at hand, and store the rest in a spice jar with a tight-fitting lid. Remember to label and date your mixture. 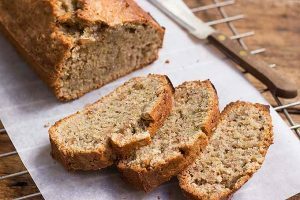 Store in a cool dry cupboard or the fridge, as the ingredients require. Grinding: This is the technique used most often for spices in baked goods, sauces and other dishes – items can be ground to a coarse, medium or fine consistency. 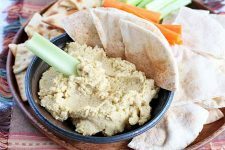 • Add your ingredients to the mortar and hold it in place with one hand. • Comfortably and firmly grip the pestle in your fist. 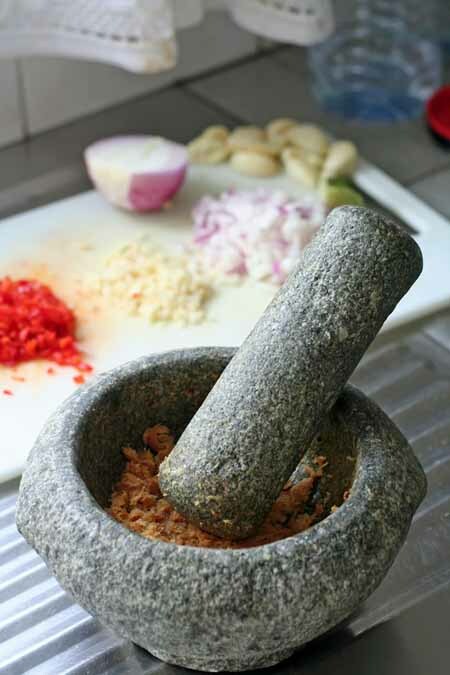 • Press the broad, rounded end of the pestle into the ingredients and roll against the floor and walls of the mortar while applying firm pressure. • Continue until you’ve reached the desired consistency. Pounding: For large seeds or spices and tough nuts, use a firm but gentle pounding or bashing to crack the hard outer shells. • Do a bit of grinding first. This is to catch ingredients that crush easily, which makes the pounding easier. 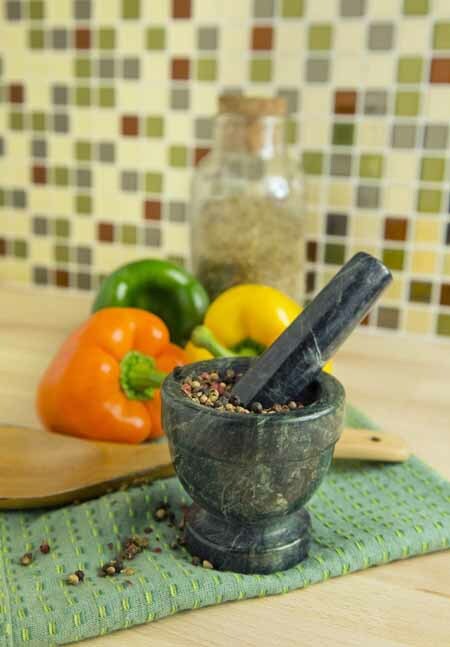 • Pound or bash the ingredients with the broad end of the pestle. Use short, staccato strokes to effectively use the pestle and speed up the process. • You may need to cup your hand over the mouth of the bowl to prevent any escapees from jumping out when pounding. • Grind a bit more if necessary. A little muddling may be needed to finish off the grinding. Crushing: In any recipe calling for crushed rather than ground spices, this just means they shouldn’t be completely pulverized or ground up. Rather, keep them half intact. •Place the ingredients in the mortar and hold steady. 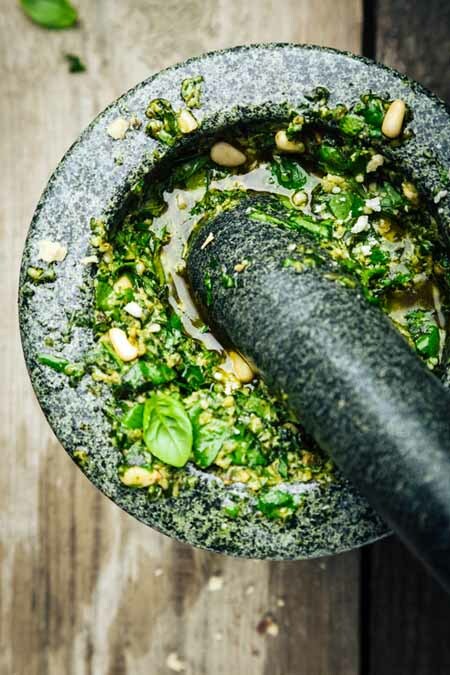 • Roll the pestle across and over the ingredients, so they’re splitting and bursting – but use restraint to avoid grinding finely. 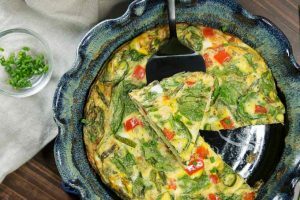 • Continue with a light hand until all of the ingredients have been crushed appropriately. 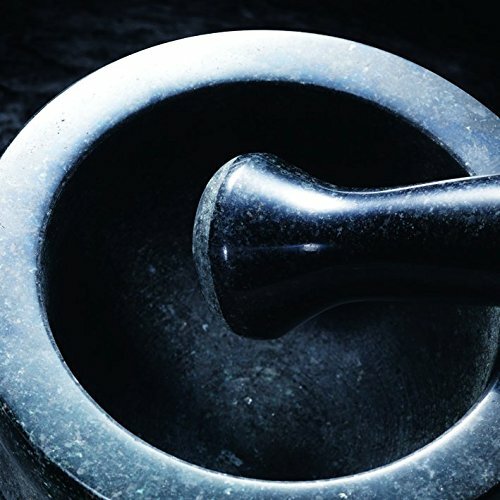 As with any good tool, the mortar and pestle will do most of the work for you if you simply apply the needed motions and energy. They’re not overly expensive, so try to get the best in your price range to really appreciate the benefits. And now on to some quality product selections for you to add to your list when choosing your model (or models – these can become quite addictive and you may have a collection before you know it!). 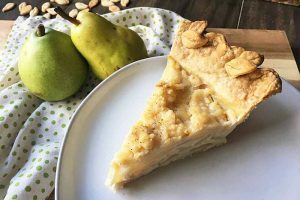 Although we don’t normally endorse products that have the names of celebrity chefs thrown on them as sales gimmicks, there are the occasional exceptions when the product is of decent quality despite the celebrity branding. This one of of those exceptions. 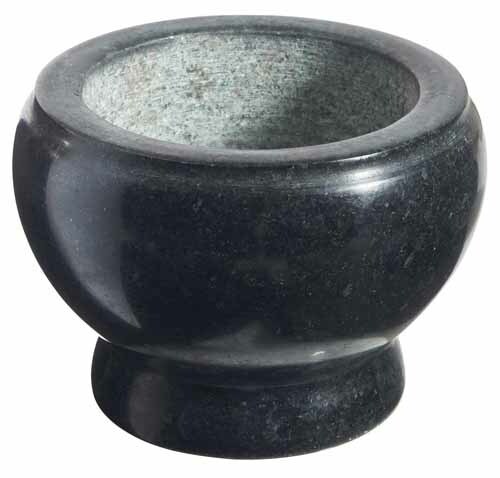 This sturdy set is hand carved solid granite, and has a 3+ cup capacity in the inner bowl, which measures 6”. It stands 6” tall with a 1” lip and comes with an 8” pestle, weighing approximately 7 1/2 pounds. The finish on both the inner bowl and mallet end has been left unpolished, making it ideal for grinding up even the hardest spices. Want friction between the inner bowl and pestle? This piece has it in spades. 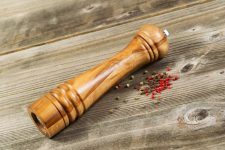 No more chasing the peppercorns around the container as you would with porcelain or even smooth marble versions. This set is ideal for crushing and grinding spices, herbs, pesto and nuts. Happy customers enjoy the large bowl capacity that prevents spilling, its very robust profile, authentic and well- made construction, the heavy-duty pestle, and its natural and handsome appearance on the counter. The other side of the coin is that this set is very heavy to lift for emptying or cleaning. And it needs a pad underneath to prevent marking the counters. Available from Amazon. Constructed of solid granite, this model is tough and durable, with a rough well and pestle tip for superior and smooth grinding. Good for small or large jobs, this unit measures 4” in height with an outer diameter of 5.5”. The inner bowl is 3.75” in diameter and 3” in depth, and it weighs in at approximately 6.5 pounds. Season first by grinding with white rice to remove any stone dust. Many happy shoppers report that this model is a good size with an effective grinding motion for smooth powders and pastes, it’s well made, solid and heavy duty, and it looks great on the kitchen counter. There are a few complaints about chalk in the bowl and the need for seasoning before using. Read actual customer reviews on Amazon now. From LUX, this stainless steel model features a rubber non-skid base, and is made of quality 18/8 stainless steel with a brushed finish. The pestle is bottom weighted, as is the cast mortar base. This set measures 4 x 2.5” with a one cup volume, and the mallet is 7” in length with a rounded top for greater comfort. The smooth and non-porous surface is easy to clean and weighs less than one pound. Happy fans like the heavy cast base of the mortar and the weighted pestle, remarking on the nice weight and feel of it in the hand. Other favorable features are the rubber base that doesn’t travel on the counter, the quality materials and construction, and being stainless it’s easy to clean. Not a lot of negative comments, but a few pointed out having to remove the rubber base ring when cleaning as it will hold water. Check out all of the reviews on Amazon. This heavy stainless steel duo has durable, double stainless steel construction with a non-skid base for secure grinding of spices, herbs, pastes, tapenades and more. Non-porous stainless resists odors and is easy to clean. Measures 3.5” in height and 4” in diameter with an inside depth of 2.5”. Satisfied customers like the ease of grinding spices and medications, and the smooth, non-porous surface is good for easy clean up – good value for the price. 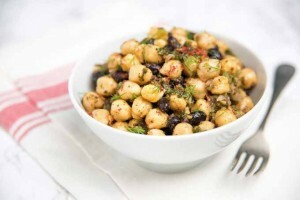 However, there are a few negative comments about the quality of the stainless steel being cheap, and reviewers say the inner surface is too smooth to adequately grip some foods such as dried herbs. See it now on Amazon. This superior set is made of clay for lighter weight grinding duties, and is ideal for creating pastes, marinades, pestos and tapenades. It’s also great for making dry rubs or pounding garlic and peppercorns. Measuring approximately 6″ wide x 3.25″ tall, this handcrafted bowl and mallet has an extra-long and thick wooden handle for efficient and easy grinding, while the bowl has a unglazed interior for the efficient mixing of ingredients. A glazed exterior is available in 4 colors (including Juniper, Nougat, Sand, and Slate) and provides visual appeal in the kitchen. The bowl is supposed to be dishwasher safe (but I wouldn’t risk it) while the pestle should be rinsed in warm water and air dried, using a little mild soap if needed. Only a few reviews are in, but those who did write like its size and efficiency for grinding. And one commented that this M&P set was beautiful enough to put on display while providing a solid handle with just enough grit on the pestle end and the bowl to provide excellent grinding. See all of the available colors on Amazon now. 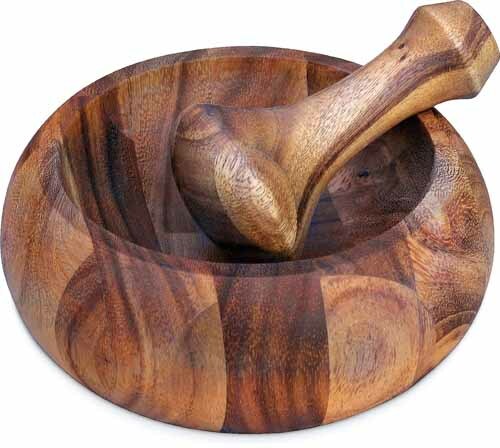 Made of beautiful and environmentally friendly Acacia wood, this attractive mortar and pestle measures approximately 6 x 3 x 6”, with the internal bowl being 2” deep and 4” wide. The wooden pestle is 5.25” long with a rounded top for comfort, and a wide 2.5” rounded bottom for smooth grinding. The entire unit weighs just over 1 pound. Season with your favorite cooking oil after each use to keep the wood from cracking. Those who are satisfied with their purchase find this model to be a good size, effective, functional and very stylish with the pestle meshing nicely with the size of the well in the mortar. The only complaint is that it’s too small. See more reviews on Amazon. The #1 Bestseller on Amazon in mortar and pestles, this set packs a lot of value into its components. Made of hefty white marble with grey veins, it offers beauty and functionality in its 4.5 x 2.5 x 5.5” frame, which weighs 1 pound and holds about 8 ounces in the well. 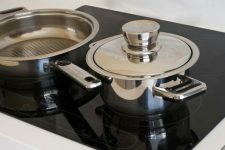 With a slightly rough surface in the bowl and mallet, it grinds herbs, spices, roots and other ingredients with ease, and is equally adept at grinding pills for pets and humans too – and it has a felt pad on the bottom to protect countertops. Hand washing is recommended before first use. 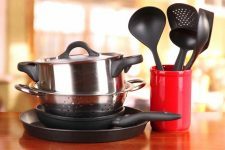 Lots of happy customers like the heft and sturdiness of this set, its ease of grinding, the good value for the price and its handsome appearance. Most complaints are about its small size – good for meds and small amounts but not for generous amounts of herbs, etc. And there is dust or chalk from the manufacturing process when it arrives, so season or wash first before using. See more comments from actual users now. 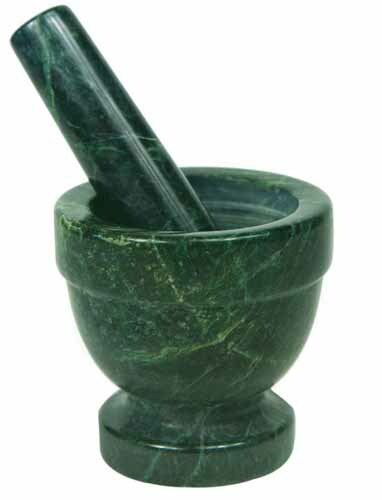 This M & P set is made of gorgeous green marble, adding beauty to this functional kitchen tool. The set is available in 3 and 4-inch versions with the smaller weighing just one pound. The larger version is a more robust 3 pounds with both products featuring a heavy pedestal base for extra stability when grinding. Both the 3 and 4-inch units are also available in white and slate grey, but I’m in love with the green. 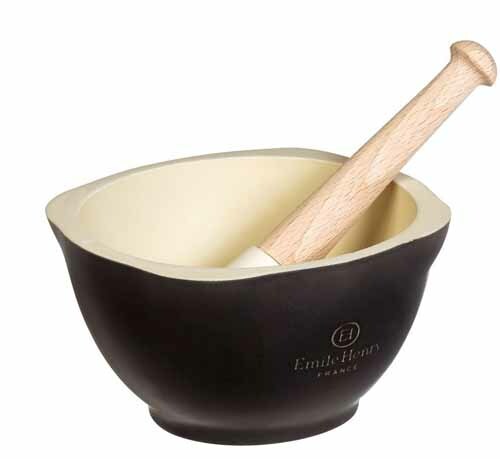 The bowl as well as the pestle have a slight pebble to the smooth surface for ‘grabbing’ herbs and spices – which helps to keep them in the bowl while pounding or mashing, making for fine powders and smooth pastes. The happy customers are very impressed with the elegant beauty of the marble, as well as its durable nature and quality craftsmanship. And, they say it’s easy to clean, with a deep bowl that keeps seeds and spices in place. Most unhappy comments are because it’s too small for their kitchen needs – this applies toward the 3-inch version and is why I’d recommend the 4-inch model. See the available sizes and colors on Amazon now. 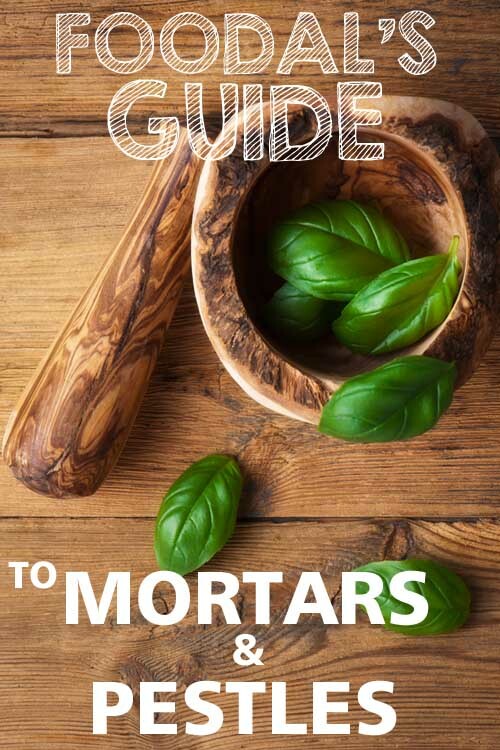 And that’s our conclusion on how to buy and use the best mortar and pestle for the job – have a look at the checklist above before purchasing to ensure you’re getting the right utensils for your needs. First published August 10th, 2015. Last updated January 7th, 2016. It is great to see some tools we have been using for years still hanging around. 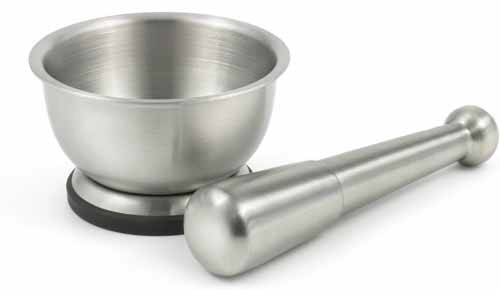 Although I don’t have a motar and pestle set at home, it would be nice to have one. We have some spices that we use but it’s crushed. One of the spices would be crushed red peppers. If I was able to grind it into a powder, I would probably eat the red peppers more often. A simple and ancient tool Jasmine, yet surprisingly versatile for many purposes in the kitchen. And once you’ve tasted your own fresh ground spices and herbs, it’s hard to go back to pre-ground. She said it cost more money to ship the heavy thing than she paid for it. I have a mortar and pestle in my kitchen, but I’m going to be entirely honest, it’s mainly there to impress guests into thinking that I’m a good cook. When I first bought it, I thought that it would be much easier to use than it actually turned out being. I appreciate that you included instructions as to how to use it! Even though it looks simple, there’s a lot more technique involved than one would think. Maybe I’ll finally dust it off and give it another whirl after reading this. Well, they are an impressive looking piece of kitchenware Bozusaki! And once you get a hang for the motion and rhythm, they’re fun and easy to use as well. I have a wooden pestle and mortar at home that I normally use to pound my ginger and garlic for beef stew recipes. It’s a very effective method of crushing spices to bring out the flavors. My biggest challenge is on cleaning the wood. The odor seems to stay on even after cleaning it. I have to leave it in open air in the sun to allow it to completely dry. I never store it when it’s wet because the smell get worse. I’m starting to believe that stone is a better option. 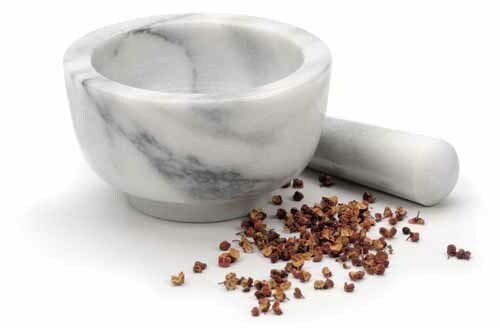 My mother and I have used our motar and pestle for many years now, she has the white marble one and it works really well and hasn’t kept any pesky odors. I know the article says the wood sets are often less heavy duty but I was curious if one made of olive wood might work better considering it is a more dense wood. Is your set sealed because that could be why it holds odor so much more. My mom purchased a set of wooden cutting boards from a woman, she sealed them with a product, I forgot, but they have held up beautifully over the years with little to no odor residue. Olive wood is a good choice for a wooden set K. And, really, it’s a matter of personal preference as to what material to get… they all have their pros and cons. That is one of the characteristics of wood sets Omondieve. Despite their beauty, the porous nature can take on odors. Try rubbing both the mortar and pestle with half of a lemon and set in the fresh air and sunshine for a while. Or soak in a mild vinegar and water solution. BUT, only for a couple of minutes, as it is wood and will absorb the water and crack if left too long. Season with a light coating of a healthy oil afterwards. And repeat with the lemon & oil each time its used to help keep the wood vibrant. Wow, I never thought there’d be a lot more other types of mortar and pestle sets than the ones my family already uses. Such a simple kitchen tool can have a diversity of sorts, I suppose. Now that you mention it, it is a bit rough and hard to clean, that sometimes my fried rice tastes a bit spicy despite the lack of any spicy ingredients in it – turns out, the garlic must have mixed with the chili from curry I cooked sometime before that. Will probably buy a newer one and use your list for reference. Unintentionally mixing flavors can work sometimes, but at other times it’s not so great… glad you found the post useful xyonj, hope you find a set that works for you. Wow, I never realized how much thought is put behind the decision of choosing a mortar and pestle. We have been using one that has been passed down in the family for many year, but it appears we are due for an upgrade. 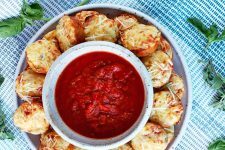 Could you post some recipes that call specifically for the use of them? It tends to sit on our counter, more as a display piece. I would definitely love to learn how to integrate it into our cooking more! They do make great decor pieces in the kitchen! And thanks for the idea, will see if it can be incorporated into some recipes. Great article. Just what I needed. I’ve been contemplating whether to get a mortar & pestle or potato masher (for guacamole) & garlic press. This sold me on the mortar and pestle option as I can make guacamole, crush garlic, and easily grind my salt and pepper (my grinders don’t work that well). I’ll definitely have to get the Cole & Mason model you suggested. It looks to be the perfect size, weight, and finish for most any project. Thank you. So glad you found the post helpful lb, you’ll be pleasantly surprised how much you actually use your m & p. Enjoy your guacamole! 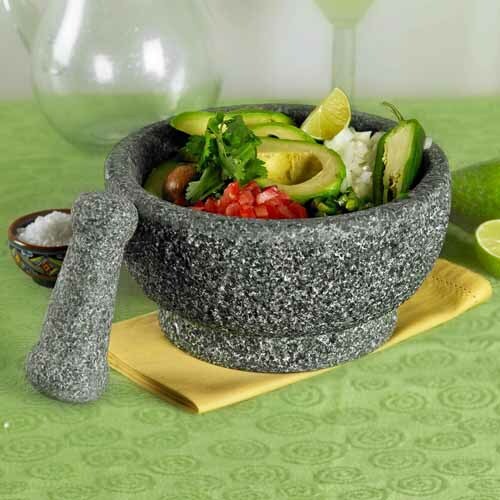 I make a lot of guacamole so I was interested in getting mortar and pestle both for its functionality and for appearance when I host parties. I found a great stone one at Costco a few months back. It is decent size and very durable. It probably weighs about 10-15 lbs. I don’t remember what kind of stone it is but I definitely recommend for anyone who has a Costco membership to get it. They only have one to choose from so you can’t get confused. They’re a great addition to the kitchen Kimmy, glad you found one you like – sounds like it was a good score. Thanks for the recommendation! I’ve recently been looking into mortar and pestles to expand my collection of cookware, but I hadn’t a slightest idea where to begin. I never realized how big they could be before reading your article! They can be pretty heavy too! I didn’t realize that grinding herbs gave a more potent flavor either, I had always assumed that it was a matter of preference. Thanks for the little beginners tutorial as well, I wasn’t aware there was so much too it, I just assumed you just threw things in and crushed them up! The more you know I guess! There’s some monsters out there sterlingjay0123! Glad you found the post useful. My parents own a model made from granite, and they use it for dry spices only. I really think that having multiple types is better. 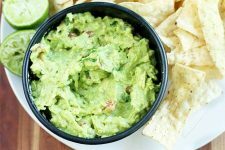 Your want a rougher model to grind up dried, hard substances like seeds while a smoother ceramic model would be better for things like guacamole that you don’t want to clean out of cracks and crevices. 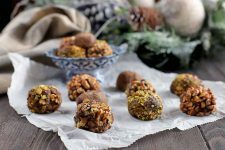 Good point vegan93, having a variety for different ingredients is the best of all worlds… and they look great in the kitchen! I do hope the fox run pedestal has a felt pad on its base as well, as I have a rather delicate kitchen countertop. That aside, though, I think it would make a wonderful replacement for my shallower marble mortar. My extended family’s been coming over a lot lately, and I’ve been needing a mortar with enough capacity to grind all of the extra spices I need to prepare lunch for everybody. Additionally, that green finish is definitely easy on the eyes. Well to be honest I really do not pay as much attention to mine as I should. I have an old set here that I have been using for many years, and now that I think about it would be a nice thing to get as an upgrade. Actually, the wife uses it a lot more so I am thinking maybe a gift idea (although I usually do not like to do kitchen things for gifts, so we’ll see). Thanks for the tips though, and I am sure they will come in handy. Glad you enjoyed the tips rz, and I think a nice M & P set would be a great gift! This is mindless. You don’t want a porous model. PERIOD. stuff gets into it. Ceramic is the way to go. One thing that has always been worrying me about mortars & pestles . . . 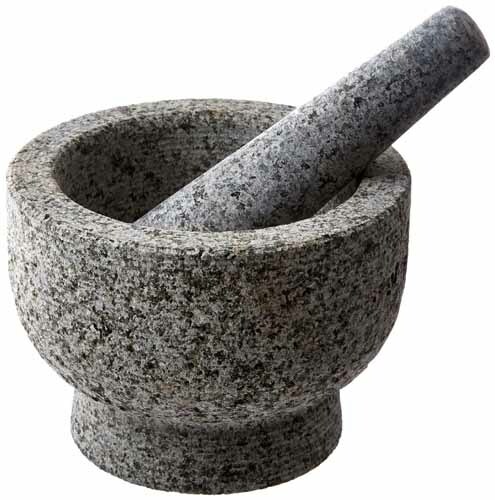 While grinding the ingredients won’t the pestle inevitably grind against the interior surface of the mortar leaving fine dust of the granite/marble (or whatever material making the mortar/pestle) to infiltrate into the ingredients? I have a granite 7″ mortar and pestle set. While it’s great for bashing garlic and grinding spices, I’m in need of one that has a bigger bowl to mix ingredients for dishes like guacamole and condiments such as Thai red curry paste. Finally, I decided to get an extra-large granite mortar with a 4-5 cup capacity. I can’t wait to season it and put it to use. I have SEVERAL mortar and pestle sets of various sizes and weights. I limit the types of materials that they are constructed from to two: Granite and Marble. I would not even consider purchasing one made from any of the following materials: Wood, Clay, Ceramic, Stainless Steel, Soap Stone or Cast Iron. I would also not purchase one of those Mexican Molcajetes made out of volcanic rock because they are way too porous, they take forever to condition and to clean and they simply absorb way too much of the material that you are processing – especially if you are working with small amounts. I like Granite and Marble because they are tough, durable and weighty. The inside of the bowls must also have a rough, abrasive surface as well. Also, ALWAYS buy the largest set that you can find and/or afford. My largest is nine inches across in diameter and it has a six cup capacity. It weighs in at just over twenty pounds and it comes with a pestle that is about three pounds which allows it to do most of the pounding for you. Of the TEN mortar and pestle sets that I own, it is my favorite. It is hand made in Thailand. It is difficult to find one much larger than this. Happy Cooking! Why do you not like cast iron? 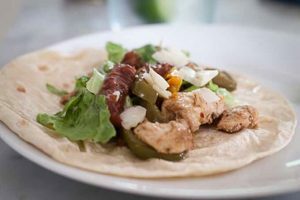 Easy Chicken Fajitas for Weeknights: Get Your Tex-Mex on Now!